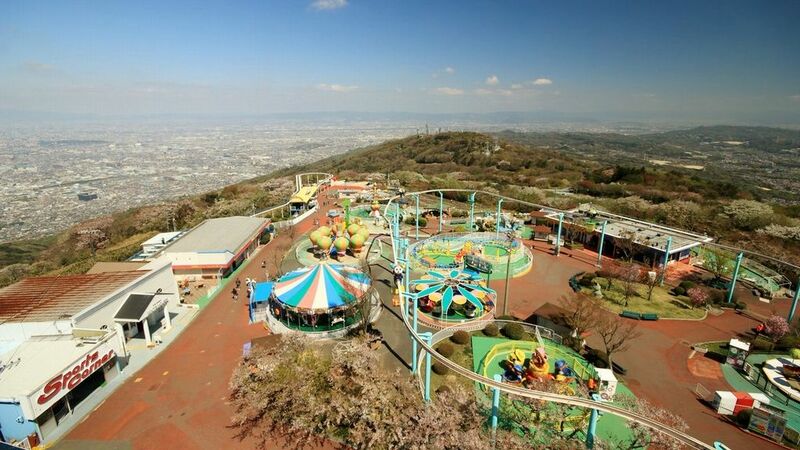 Ikoma Sanjo Amusement park at the top of Mt. Ikoma (642m) in the border of Osaka and Nara was opened in 1929. Visitors can overlook Osaka Plains and Nara Basin, along with panoramic views as far as Awaji Island and Akashikaikyo Bridge. There is a variety of play equipments and facilities to captivate families and couples. The park features 27 different varieties of ride adventure and facilities. These rides are not so scary but to captivate families and couples. The top attraction could be the flight tower. A 30m tall, the oldest flight tower in Japan was constructed in 1929. From the tower top, visitors can see the stanning view of Osaka Bay. There is also “a dogs and cats petting forest Ikoma” housing 80 rare, curious, and cute dogs and cats from around the world. “Cycle monorail”is recommended to enjoy a great view while pedaling at your own pace and The amusement park open late till night during summer and there are many people visit to enjoy the night view. “Mount Ikoma view restaurant”, located in the right side of the flight tower is also recommended to see a amazing view from the terrace. Access : From Ikoma station on the Kintetsu Nara line, take Ikoma Cable to Ikoma-sanjo station.